The lives of partisans depended on their ability to remain unseen, undocumented and unidentifiable. But one fighter, Faye Schulman, had a camera. The only known Jewish partisan to capture the World War II experience on film, Schulman’s rare collection of images captures the camaraderie, horror and loss, bravery and triumph of the rag-tag, tough partisans – some Jewish, some not – who fought the Nazis and their collaborators. Born in Poland in 1924, Faye Schulman received her first camera from her brother when she was 13. It was that camera which ultimately saved her life, and allowed her to later document partisan activity. 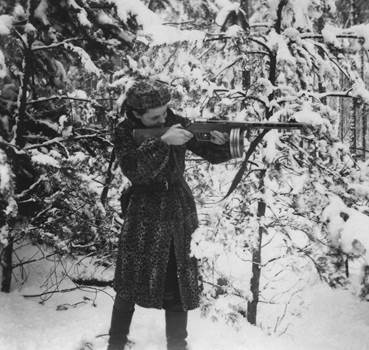 Pictures of Resistance: The Wartime Photography of Jewish Partisan Faye Schulman poses probing questions about this incredible woman and the people whose images she documented. What is a Partisan? A partisan is a “member of an organized body of fighters who attack or harass an enemy, especially within occupied territory,” and during World War II these groups destroyed railroad tracks, blew up fortifications, ambushed German-occupied towns, and disrupted communications in order to stop the invading Nazis. Hear women’s words of resistance performed by First Stage youth actors and get a sneak peek of ‘Stories of Resistance’ Workshop and curated StorySlam with Ex Fabula. Everyone has a story of resistance to tell. Using the theme “Untold Stories of Resistance,” Ex Fabula coach, Karen Kolberg, will teach you effective storytelling skills, help you connect with other storytellers, and let your voice be heard. Over the past two centuries, women have led different kinds of resistance movements, with differing political ends, from advocating for the abolition of slavery to advocating for the right to vote. Join Lilly Goren for an important exploration of women’s voices, their engagement, and their advocacy which has had significant impacts on the lives we all lead today. In this gripping documentary, three Jewish women recall their lives as teenagers in occupied Holland, Hungary and Poland, when they refused to remain passive as the Nazis rounded up local Jewish populations. Join scholar Amy Shapiro for a talkback to explore the significance of Faye Schulman’s unique form of resistance. Join us for a conversation on the heroism and perseverance of Jewish resistance fighters – in the ghettos, camps, in partisan units and in a variety of underground organizations – who chose to respond to the Nazi Final Solution plan by resorting to armed resistance.